Intense Shine. Intense Moisture. Replenish your hair with a synergistic blend of plant oils. This silicone-free multipurpose treatment is great for brittle ends, damaged, or color treated hair. It also delivers brilliant shine, finished styles, and leaves hair smelling divine. The silicone free formula of potent botanical oils creates a radiant finish and natural-looking shine. It repairs damage from styling and elements, balances scalp sebum, and leaves hair smelling beautiful. Avocado leaves a natural-looking shine without weighing the hair down. 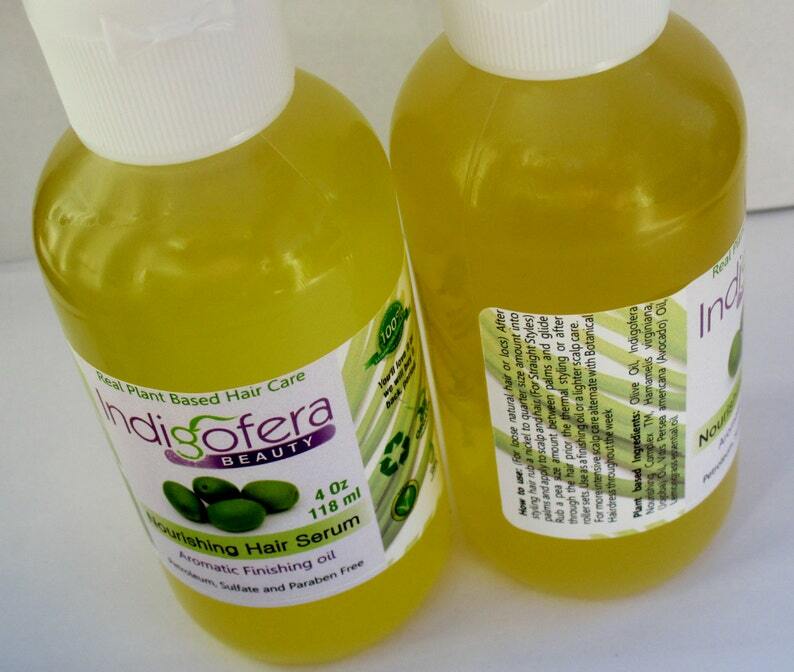 Jojoba oil Infuses hair with vitamin rich, plant based healing properties. How to use: ( For loose natural hair or locs) After styling hair rub a nickel to quarter size amount into palms and apply to scalp and hair. (For Straight Styles) Rub a pea size amount between palms and glide through the hair prior the thermal styling or after roller sets. Use as a finishing oil or a lighter scalp care. For more intensive scalp care alternate with Botanical Hairdress throughout the week. Apply a small amount of Nourishing Hair Serum mixed with (Botanical Conditioning Cream or Organic Hair Souffle) to clean damp hair. Cover with plastic cap steam or heat for 25 minutes. Rinse well and style as desired. Isn't it time to Experience REAL PLANT BASED Hair Care? Each of my sought after formulas are blended from scratch. Generous amounts of pure aloe, virgin coconut and nourishing avocado make Indigofera the Gold Standard in premium plant based hair care. Smells fresh, uplifting and natural. Send a convo for questions. I am always happy to help.